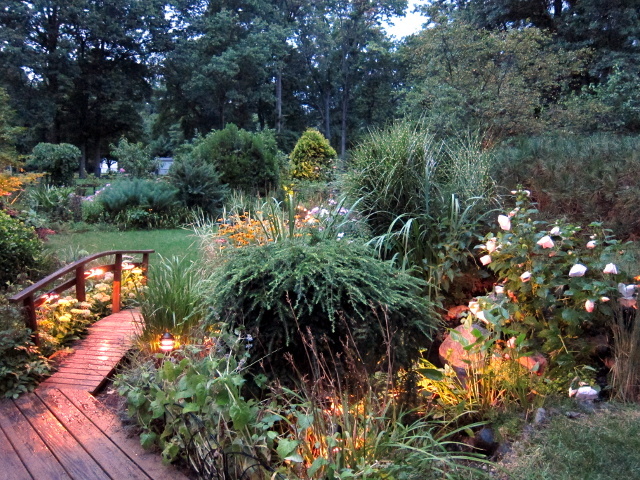 With both kids off to college, you'd think there'd be more time for working in the garden and posting web updates. Somehow though, it seems we have more things to do now than when the kids were home! I've also been teaching myself how to maintain, diagnose and repair our 2000 Sienna and Civic automobiles. 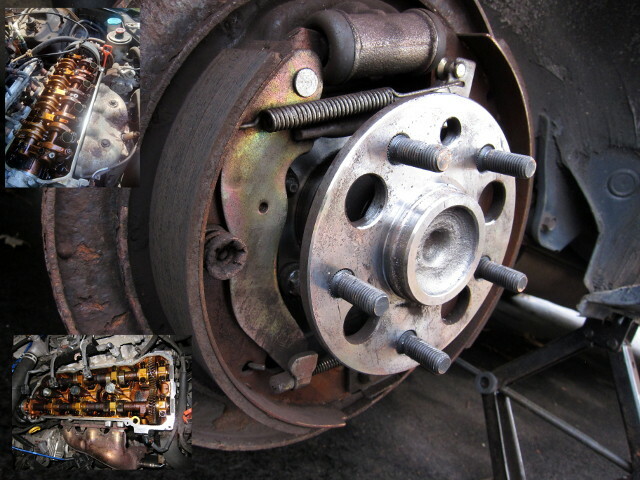 Not just oil changes, but spark plugs and wires, wheel bearings, drum and disc brakes, valve adjustments and gaskets, starters, exhaust work, and sundry other things. Thanks to Edd China, whose television show and YouTube videos gave me the confidence to work on our cars. Oh! 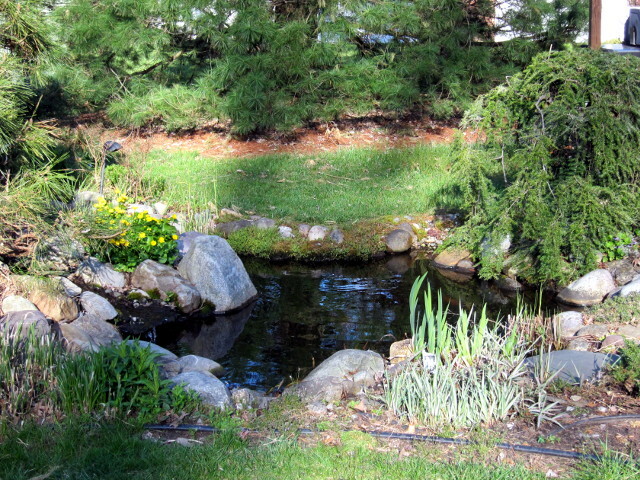 But you are not here to see my car pictures or read about do-it-yourself auto repair... so, let's get to the garden and pond! 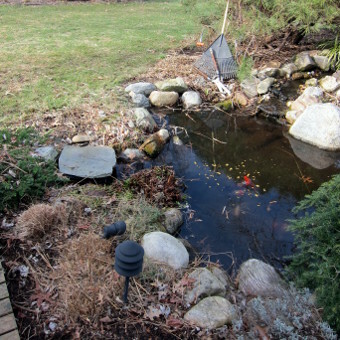 These pictures from February 2016 show the only pond-related task that needs to be done before Spring arrives. 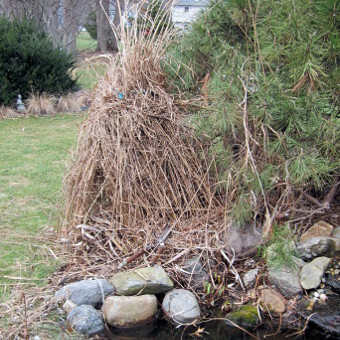 All the dead grasses from the previous year have to be cut down before the new growth comes up. 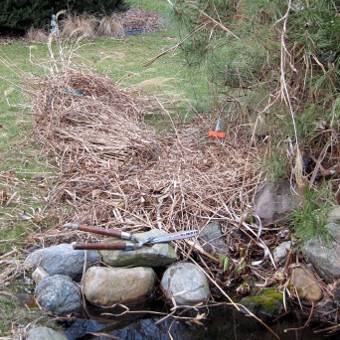 I leave the smaller grass clippings under the Japanese Pine (behind the pond) for the birds to use when building their nests. Like pruning, I really enjoy this annual task because it gives me a reason to get outside during the Winter months! 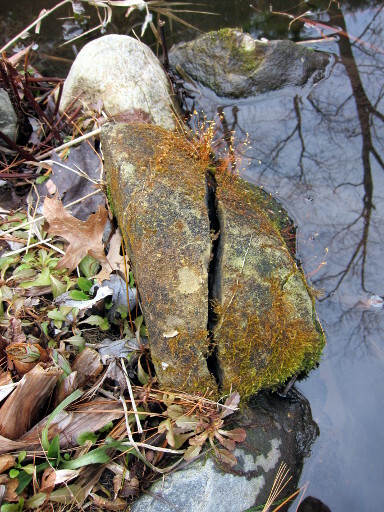 Positioned at the edge of the pond for over 15 years, this large stone succumbed to frost weathering. The power of frozen water has split this stone in half! Whether this was a case of Ice Segregation or Volumetric expansion, I know not... but I do know that this is the first time I've seen this happen here! While I enjoy all four seasons, Fall has always been my favorite. This picture was taken a few days before my birthday in November, 2016. Who could ask for a better present?! In the background, over to the right, you can see our apple orchard. 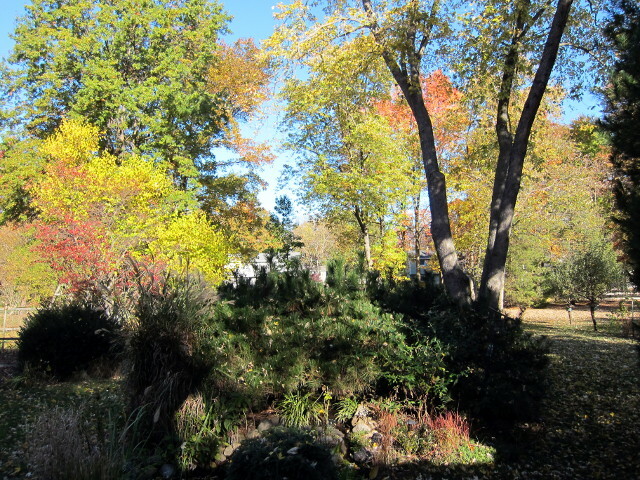 The apples from the Enterprise tree in the foreground are gone by now, but the GoldRush tree behind it has apples that are ripe. 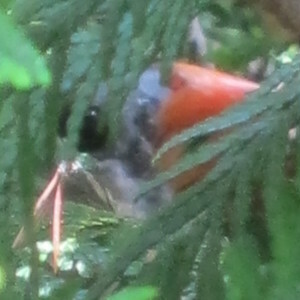 In July 2017, a pair of Northern Cardinals built their nest in the shrub between our back deck and air conditioning unit. They often build on the East side of the house, but last year I pruned the holly bushes really low so maybe this was the next best location? At any rate, this pair successfully raised 3 chicks in 2017 (second photo), all of whom learned to fly in that towering White Pine tree in the background. The third photo was taken this year, in June 2018, and I can only assume it's the same female who returned to nest here again. 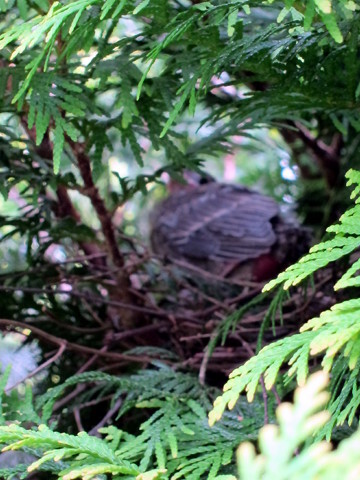 We can sit on the back deck and she'll pop out for a quick bath or food, then stop in the White Pine to preen before flying back into the shrub. As evidenced by this photo, we can even look in on her and her 3 eggs. So I guess this is good location for a nest after all! 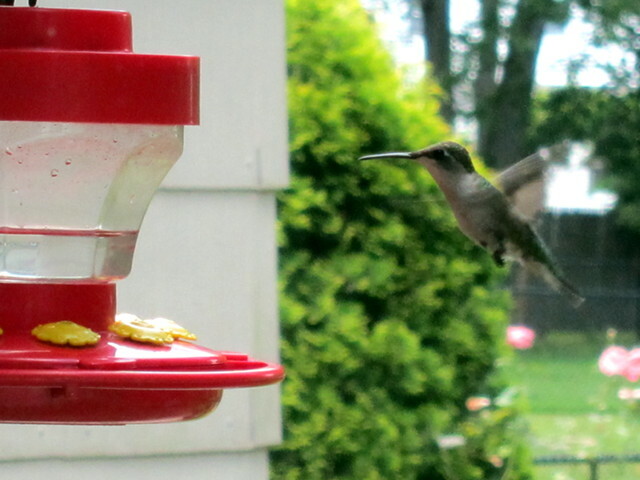 Catarina thought we needed more hummingbird feeders, so we added a couple, including this one by the kitchen window. What an excellent idea! While standing on the back deck, sometimes a hummingbird will fly right past our heads to a feeder with all the precision of a Blue Angel pilot... at which point, we stand perfectly still and slowly turn our head to watch them dine. And of course, when one comes to the window while we're having a meal, we also stop to watch them! We had a rain shower the evening of August 3, 2017. After it passed, the sky was spectacular and lit the landscape in a memorable way. I grabbed the camera and took this picture. 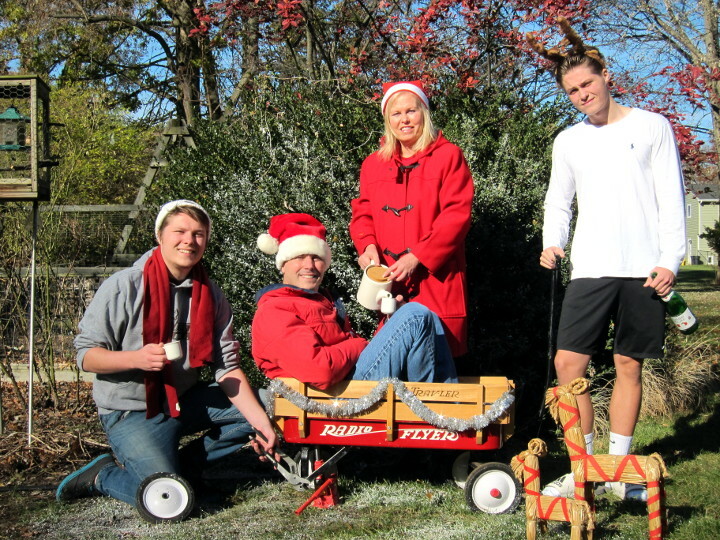 And while this photograph does not completely capture the image I have burned in my mind, it's still a nice picture! 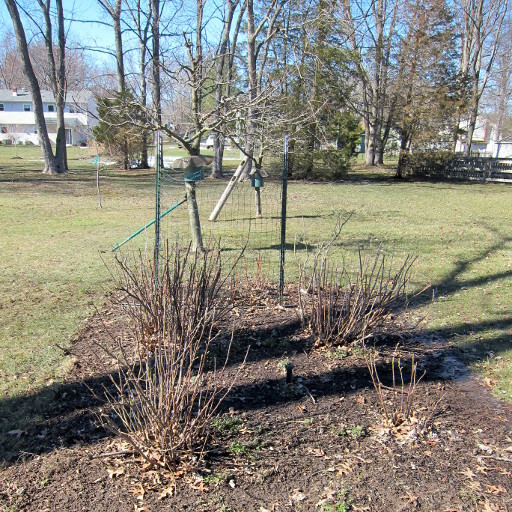 After another long Winter, I'm back outside in mid-March 2018 pruning the apple trees, raspberry, and currant bushes! You may notice that the apple trees are propped up, one with a fence post and another with a garden hoe (whatever works :-)). We had several strong Nor'easter storms in late Winter that left our apple trees leaning westward. The solution is to simply push them upright (while the ground is still wet) and keep them in that position for a couple weeks until the ground becomes less saturated. The raspberries are mainly for snacking, but the berries from the red and black currant bushes are used to make a Swedish drink called saft! A month later in mid-April 2018, the new blades of grass are coming up. 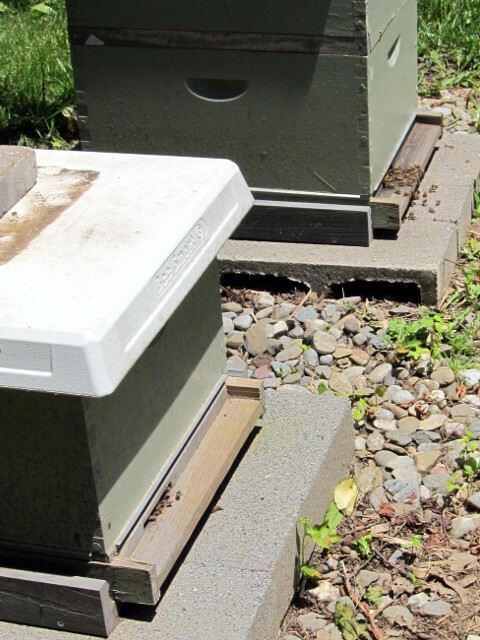 I lost one of my honeybee colonies over the 2017-2018 Winter. A new package of bees costs around $130 (1000 SEK), and with 2 kids in college this year, I decided to leave the other hive empty. But as luck would have it, on June 20, 2018, my surviving colony hatched a new queen and then conveniently swarmed in the backyard! 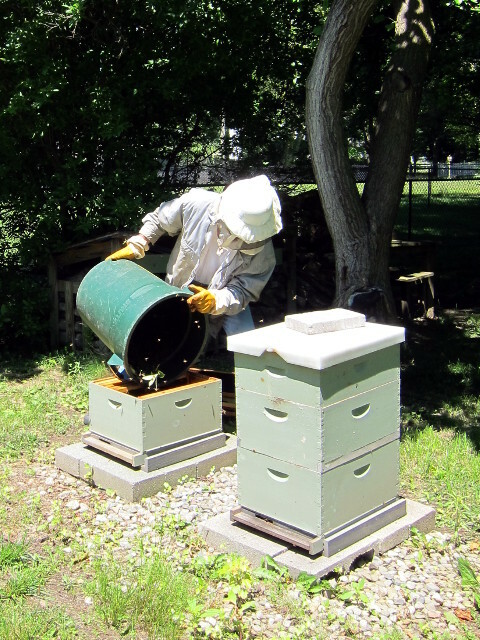 All I had to do was collect the bees in that green bucket (again, whatever works :-)) and relocate them to the empty hive! 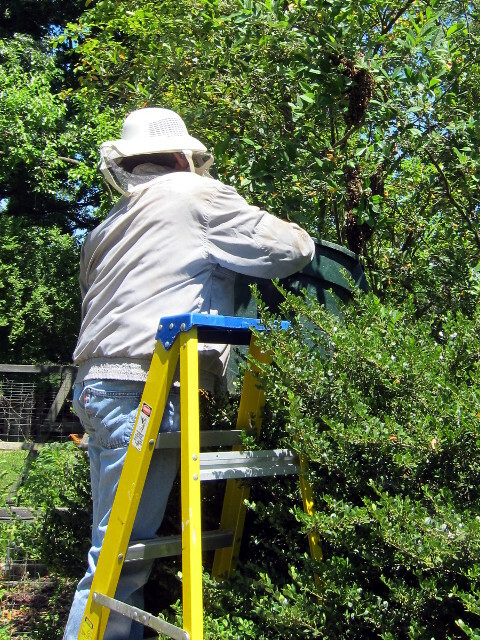 In these first two photos, I'm clipping a couple branches that contain small clusters of bees and putting the branches in the bucket. 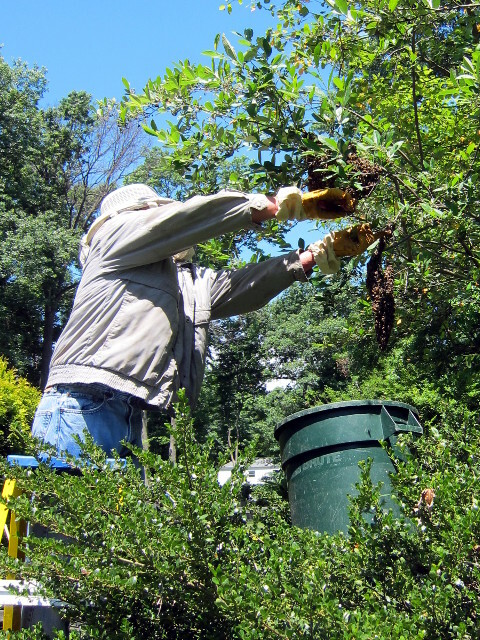 After that, I shook the branch supporting the one large cluster (likely containing the queen) so all the remaining bees were in the bucket. I now have a bucket of bees. 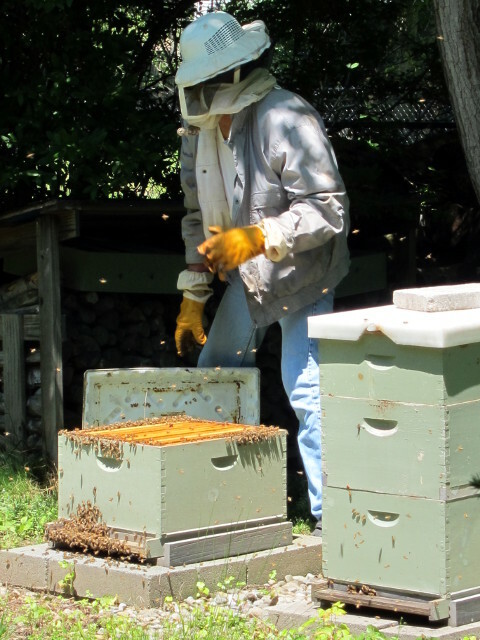 When swarming, the bees are engorged on honey and are docile (they have no hive to defend) so I probably did not need to wear the head gear or jacket. While clustered here, about 20-50 scout bees will be out searching for suitable nest locations, but I already have the perfect place for this colony! I removed a few frames from the empty hive and then poured in my bucket of bees. After pulling out the cut branches, I gently replaced the wax frames. What could be easier?! 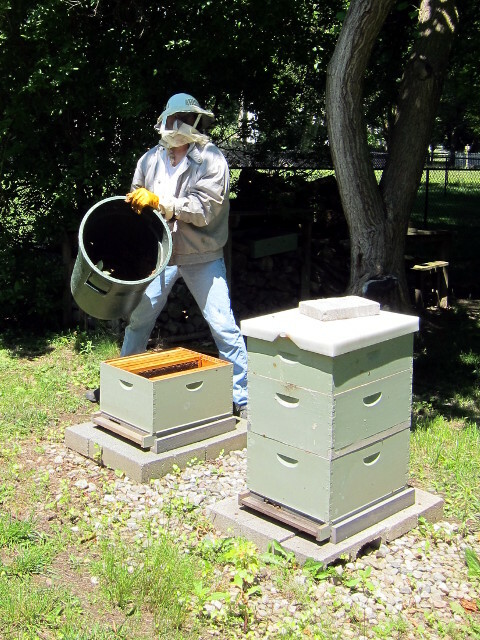 I then brushed the bees off the top of the hive box and carefully replaced the inner and outer covers. 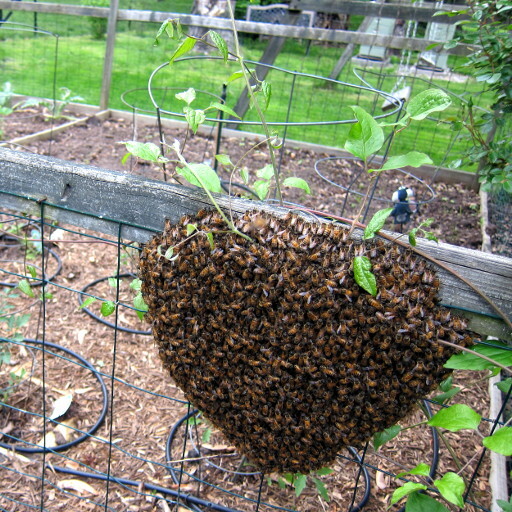 Shortly thereafter, all of the bees marched into the hive and probably had a big housewarming party. But the next morning, they were out again and hard at work! 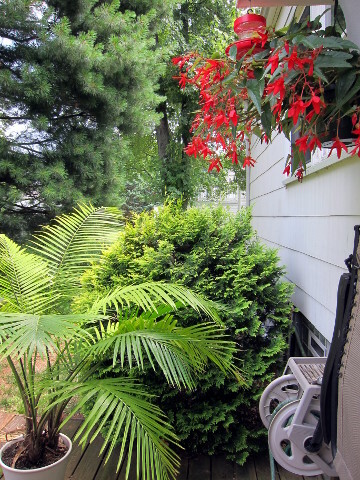 Back in 2013, you may recall that we converted a storm-damaged tree into a planter? 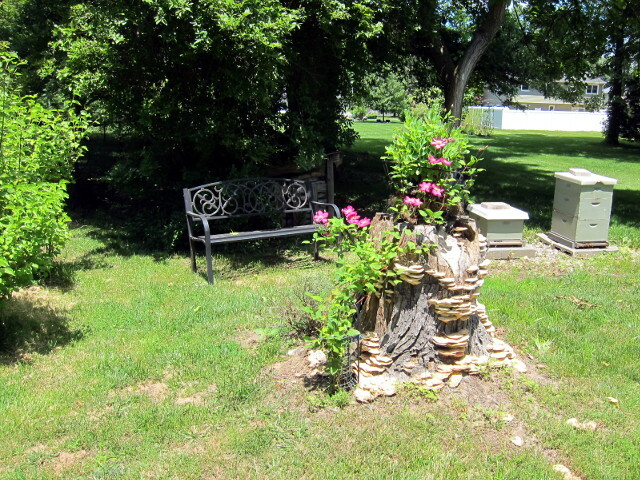 A couple years ago, we also added a Ville de Lyon Clematis and, this year, the stump has adorned itself with some kind of fungi! After 5 years, I think we can call our stump-top planter a success!